Millions of people invest in the stock market in hopes of growing their nest egg large enough for a comfortable retirement. The appeal of stock investing is simple: it offers much bigger returns than your everyday savings account. To wit: Since 1926 the S&P 500 has generated an average annual return of 10%, according to Ibbotson Associates. The faster growth of stock investments offers you a fighting chance to build a large enough portfolio to replace your earned income. In this month’s newsletter, we’ll chronicle market volatility to provide better context for your stock investments. Then we’ll introduce a revolutionary idea used by professionals to mitigate market craziness and protect investments during bear markets. You can use it to protect your retirement too! When you hear that the stock market has generated upwards of 10% in average annual returns, it’s easy to envision investing as a gentle walk down easy street. Some mistakenly think the rewards are like that of a bank account where the interest streams in consistently year after year. If only! The truth is there is a mountain of variation in returns from year to year. Furthermore, the intra-year volatility can give even the most prepared participant whiplash. 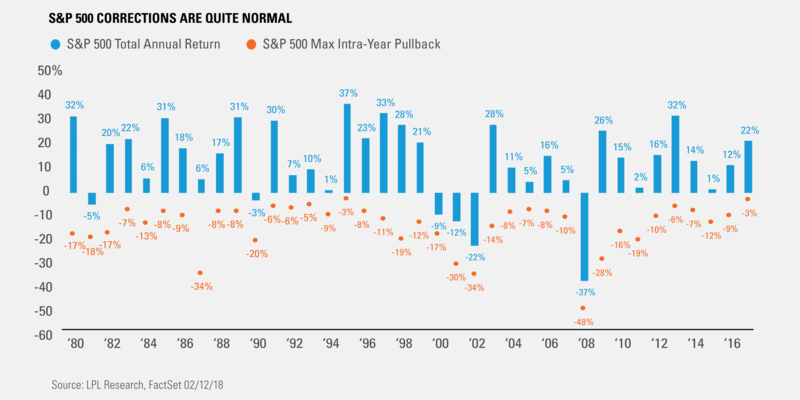 For context, take a good look at the accompanying graphic which shows the S&P 500 Total Annual Returns in blue and the Max Intra-Year Pullbacks in orange. The data covers 37 years back to 1980. The best showing for the bulls was 1995 where the market scored a rousing 37% gain. Back then the internet was in its infancy, and starry-eyed investors were going gaga over the potential. No wonder money seekers view stocks with fondness! Not many asset classes have the ability to deliver such a rousing return in a single year. Unfortunately, the profit-laced heights of ’95 were matched by the depressing depths of 2008 where the S&P 500 suffered a mid-year halving. The retirement hopes of many were dashed, or, at least, delayed while they waited for their portfolios to recover at least some semblance of their former, fatter selves. While stocks have indeed rebounded in the years since, the memories of ’08 still haunt many investors. Students of history know deep in their bones that future market crashes are inevitable. Like a well-thrown boomerang, they always return. The question investors should be asking themselves is what, if anything, should be done about the next bear market? The principal problem with simply burying your head in the sand and waiting for the storm to pass is it may take years for the recovery to materialize. And, worse yet, your intestinal fortitude may be found lacking in the depths of the downturn causing you to panic and puke up your stocks at the worst possible time. Rather than face the ravages of the next bear as naked as a newborn, why not acquire protection? 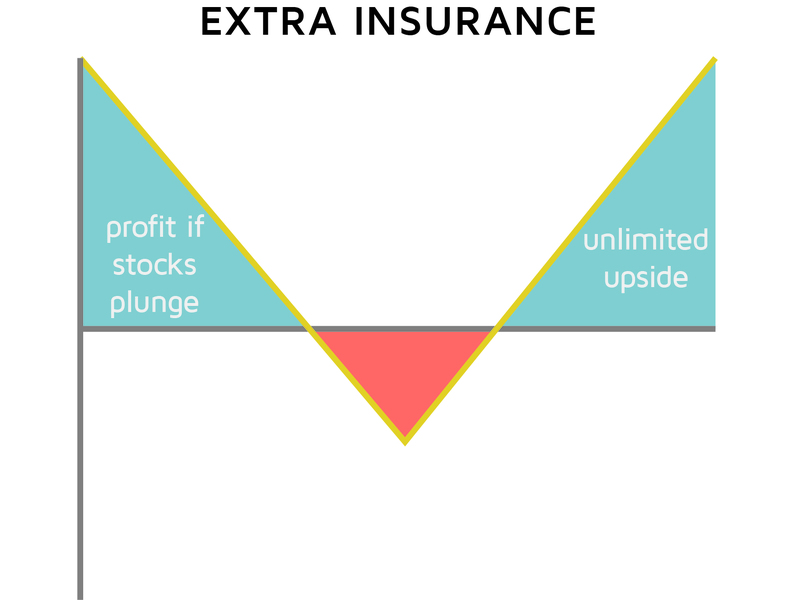 It’s an idea that’s been around since risk-reducers first came up with the concept of insurance. Homeowners buy it to protect from floods and fires. Automobile drives buy it to defend against dings and dopes (teenagers). Mortals buy it to shelter from egregious medical bills. And preppers even buy it to safeguard against famine. With a populace that’s so willing to scoop up insurance to protect everything under the sun, it’s a wonder why so few have tried to defend their retirement accounts. The reason is lack of education and know-how, pure and simple. Consider this month’s message our attempt at beginning to solve this all too common problem. Before we go any further, it’s worth taking a moment to define what we mean by “retirement” or “retirement accounts.” For many workers, this would be a 401(k) or its equivalent. There’s an alphabet soup of them these days from TSPs and IRAs to ROTHs and 403(b)s. It could also just be a regular investment account that you’ve earmarked for retirement. Regardless of its name, today’s discussion will assume you’ve invested the bulk of your beloved portfolio in stocks. Whether you’ve purchased mutual funds, exchange-traded funds (ETFs), or individual equities doesn’t matter. In all cases, you’re susceptible to market volatility and the destruction wreaked by market crashes. To put this in context, the average bear market strips some 30% away from stock values. The worst ones, like 2008, can deliver 50% drawdowns. That means if you’ve scrimped, saved, and nurtured your stock portfolio to $1 million you could see $300K to $500K disappear in the next bear market. While history suggests an eventual recovery will make you whole, it can take years for your portfolio to return to its former glory. This is where insurance comes in. In the 1970s three mathematical geniuses created a formula which allowed for insurance to be properly priced on stocks. For their groundbreaking efforts, two of the three, Fisher Black and Myron Scholes, received a Nobel prize. These insurance policies are known as options contracts and are used by traders everywhere to protect and speculate in the stock market. The one with relevance to today’s lesson is the put option. Consider it the investors’ version of bear spray. It offers protection when these mountain-sized mammals are on the prowl. More specifically, buying puts on your portfolio can minimize the potential losses from 50% to around 15%. That means with the proper purchase of puts, the max downside for your $1 million stock portfolio could be reduced from, say, $500K, to a more comfortable $150K. Because you’re able to lock-in the right to sell something at a set price, you can use put options to limit your risk if the market crashes. Essentially, the put option rises in value as asset prices fall. Let’s walk through a simple example. Imagine you own 100 shares of Apple Inc. (AAPL). With the technology titan perched at a cool $178 per share, your investment is worth $17,800. Rather than risking 30% to 50% during the next bear market, you could purchase a put option to protect. Let’s say you buy a one-year $160 put for $8 per share ($800 total). Think of the put as an insurance policy. You now have the right to sell your AAPL shares at $160 no matter how low their price falls. Since the stock is currently sitting at $178, your potential loss is capped at $18. Consider that your deductible. Said another way, you can only lose about 10% of your investment before the insurance kicks in. We also need to take into account the cost or premium paid for the insurance. By adding in the put cost of $8 we arrive at a total potential risk of $26 or roughly 15% of your investment. Think about this! We’ve used put options to limit the exposure in our AAPL stock position to a mere 15% no matter what. Defining the risk brings peace of mind and confidence during a crisis. Rather than wondering how deep a selloff will dive or how painful the plunge will be, you can sit back and bask in the knowledge that your losses are limited. This allows you to participate in the higher growth potential of stocks, but sidestep seeing your portfolio shattered by hungry bears. And this scales too. Whether you have 100 shares of AAPL in a $17,800 account or 1,000 shares in a $178,000 account doesn’t matter. One of the easiest ways to see the impact of adding put options to a portfolio is using a risk graph. It provides a visual representation of your potential risk and reward. Consider the following chart which shows the typical stock portfolio with unlimited reward and unlimited risk (well, at least until the market hits zero). It’s the big red triangle that spooks people during bear markets. Knowing your potential downside is big-league takes a hefty toll on your psyche. In contrast, check out the following risk graph of a portfolio with protection. With insurance, we turned that fear-inducing triangle into an impotent box. First, the stock market offers mouth-watering returns but stomach-churning volatility and nasty bear markets. Second, people use insurance to reduce risk in virtually every aspect of their lives. Third, thanks to the invention of put options it’s now possible to buy insurance on your stock portfolio. Just like your car insurance, you have many choices when it comes to buying puts. You can vary the deductible and duration to increase or decrease the cost. In the AAPL example above we purchased a put that had a 10% deductible. As a result, the premium was a mere $8 per share. We could have gone with a Cadillac policy providing amped-up protection and a low deductible, but it would have been quite a bit more expensive. With AAPL at $178, suppose we purchased a one-year $178 put which doesn’t have a deductible (it locks-in the right to sell the stock at its current price). With a price of $14, the premium was almost double that of the put with the 10% deductible. To keep the cost in check, we suggest buying puts that are 10% below the stock price. In trader-speak, they are 10% out-of-the-money. The number of expirations to choose from can be overwhelming. You could buy a put that expires anywhere from this week to the year 2020. To provide ample time for coverage we suggest you buy at least one-year of time. That way if the next bear market doesn’t strike soon, your protection won’t run out. Another added benefit is it minimizes the impact of time decay. Options are decaying assets and lose a bit of value each day. This decay accelerates into expiration making short-term contracts the most challenging ones to own. We avoid the whole time decay drama by purchasing long-term options. In sum, buy one-year 10% OTM puts to protect your portfolio. What if I Own Mutual Funds? Our simple Apple stock example, while educational, likely doesn’t apply to your situation because you probably don’t just own one stock. In fact, if you’re the typical investor, you probably hold hundreds or thousands of securities via mutual funds or exchange-traded funds. Fortunately, acquiring protection for such a broadly diversified portfolio isn’t much more difficult than doing so on a small Apple stock position. One of the most straightforward approaches involves buying puts on a market index like the S&P 500 to defend your stock portfolio. If you own a large basket of stocks, then your account value probably follows that of the S&P 500 quite closely. Its behavior, then, is a good proxy for your portfolio’s experience. And that means buying puts on the S&P 500 can be an efficient way of acquiring insurance for your retirement. You can either purchase puts on the actual S&P 500 Index (SPX) or its corresponding ETF (SPY). Today we’ll be using SPY. There are some sophisticated ways to gauge the appropriate amount of puts to buy, but one of the simplest is to determining your notional exposure. This can be done by looking at the total dollar amount of your stock portfolio and translating that into a certain number of shares of SPY. Then, you would buy one SPY put for every 100 shares of exposure you have. Let’s look at an example to make sure that the last paragraph hit the mark. With SPY currently trading at $270, it would cost $27,000 to acquire 100 shares. That means that for every $27,000 of stock exposure in your portfolio you should buy one SPY put to protect. A stock portfolio of $135,000 would require roughly five SPY put options to protect it adequately. And a stock portfolio of $270,000 would need about ten SPY puts. As the price of the S&P 500 fluctuates, you’ll obviously need to recalibrate the numbers to see what account size corresponds to 100 shares (and, thus, one put option). If you ever want to go down the rabbit hole, some brokers like TD Ameritrade have analytical tools that help you model your portfolio exposure with precision and, in turn, discover the optimal number of puts to buy. While the purchase of insurance to defend your stock portfolio appears a no-brainer, there is one principal drawback – cost. While the price tag will vary depending on market conditions, it’s still a burden that must be borne if you want to limit your risk. During calm times, the price of a one-year, 10% out-of-the-money SPY put may cost as low as 3% of your portfolio. That means it would require around $3,000 to protect a $100K portfolio for one year. If you wait until volatility strikes and the market is crashing before snatching up insurance, then the cost may rise to 5% of your portfolio (or higher!). Paying this 3% to 5% for protection is money well spent if we get a year like 2008 where stock prices plunge 50%. Where forking out capital for insurance becomes psychologically taxing is if you don’t end up needing it for multiple years. To be clear, paying $3K to $5K annually to protect a $100K portfolio means you have to make a 3% to 5% return on your investments just to break even! Since a properly diversified portfolio only generates an average annual return of 5% to 10%, the cost of put protection can be a massive drag on performance. There are two portfolio protection roads you can travel. The first is called always-on. The second is called tactical. If you’re willing to handicap your upside in exchange for the peace of mind afforded by portfolio insurance, then owning puts every year might make sense. We suspect investors that have already grown their account well into six figures might find the idea of permanent protection tempting, even if it means they’re sacrificing a good chunk of the upside. The alternate approach involves only buying puts when you think they’re needed. In an ideal world, you would scoop these up just before a bear market arrives to wreak destruction. In practice, it’s impossible to nail the peak of every bull market. But perhaps you can get close enough to make the tactical route practical. For example, maybe you wait to purchase puts until after stock prices have risen for multiple years (like now!). And then you part ways with your protection after the market has fallen 20% to 40% when the risk of owning assets is much lower. The basic idea of portfolio insurance involves purchasing one options contract for every 100 shares you’re trying to protect. But what if we wanted to move beyond the basics, to make leaps in logic and expand our horizons? Well, if you do that, dear friends, you’ll find all sorts of fascinating ways to use options to your benefit. For example, did you know it’s possible to make your portfolio profit during a bear market? You can do this by purchasing extra insurance. That is, instead of using the typical 3% to 5% of your portfolio to buy the requisite amount of puts, you could use upwards of 10% of your account to buy them. Then, if the market falls far enough, you will actually make more money on the put options than you lost in your stock holdings. Another idea is selling covered calls on your stock holdings to reduce the overall cost of the insurance. For example, what if in your hypothetical $100K portfolio you were able to capture $3K to $5K in call premiums over the year? That would effectively pay for the put options! This month’s newsletter has laid out many threads that we encourage you to tug at. Their continued unraveling will lead to additional enlightenment on how you can protect your retirement using the options market.